pharmacy belonging to Piotr Mikołasz. labourers and later as skilled workers in the industry. Some made and some lost fortunes; most laboured under appalling conditions. in the successful fractional distillation of pure naphtha. He applied for a patent and received it in 1853.
petroleum probably took place first in Azerbaijan in 1846, the first European activity was in the Borysław area in 1853, even before drilling occurred in North America in 1858 in the province of Ontario in Canada or in Pennsylvania in 1859.
methods. Dr. N.M. Gelber described the the back-breaking work of the labourers. The peasants in the Drohobycz District who engaged in this activity were called łepaks. They collected crude oil and mixed it with manure or with balls of straw to serve as torches to sell in the market in Drohobycz. The thick, viscous crude oil was also used as a lubricant for wagon wheels, a waterproofing agent for boats, boots, and roofs. The thinner crude oil was used for medicating skin disease in animals. There was even export trade in crude oil with Russia for use in the tanning of leather. With the industrial revolution and the need for safe and efficient illumination in large public places and factories, experimentation with the potential of hydrocarbon for lighting began to preoccupy scientists and entrepreneurs. Some of the earliest experimentation with petroleum's potential for illumination took place in Galicia. The gases below ground were not only toxic but sometimes flammable. If ventilation methods were used, they were primitive and inefficient. Injuries were common, fatalities frequent and safety measures almost unknown. Until the 1880's, regulation of the mining industry was very lax. Wells were dug too closely to one another. There were also few measures taken to manage waste water or the storage of the rocks that were removed from the shafts. The terrain was often destablilzed by these practices. Wax mining transformed the Jewish community of Galicia .It provided jobs for many; some mine owners and refiners made fortunes. Until the last decade of the century, some of the largest ozokerite entrepreneurs were Jewish firms. Iny the last decade of the nineteenth century, wax mining declined in the Borysław area. Most of the surface wax had been exploited and some of the largest Jewish-owned companies sold their properties. Two Austrian banks considered that modern mining methods would bring greater profits and with the help of the Austrian government, which imposed new regulations on he size of mining operations, most of the remaining Jewish companies could not comply. They were forced to sell at low prices or close. An excerpt from the Polish Geographic Dictionary describes the extraction of oil and natural wax around 1870. “Oil from the rocks is extracted here as well as in other areas by the making of wells which allow the oil from the deep deposits to rise up. These wells, which measure between 1-2 metres in diametre ... are dug until oil is struck and gathers at the bottom of the welils. The oil is raised to the surface by means of buckets and winches that are erected above the wells. The productive wells are protected from the elements by means of wooden barracks that allow the workers to extract the oil during the winter months. After a variable period of time, since some wells produce only for a few days or weeks, the wells have to be dug deeper. Some are abandoned when further digging does not produce more oil. Some wells, which are not adequately braced, collapse and some fill with water forcing the owners to seek other places to dig. Thus the whole valley of Borysław is studded with productive wells, as well as abandoned, half-filled wells and depressions filled with water. The number of these abandoned wells is steadily growing. The same method is used to get the wax out of the ground. The mines of Borysław produce currently more wax than oil. The softness of the wax, as well as its abundance, causes it to ooze out of crevices and fall into the wells. Many of these early wells were laboriously dug by hand. Others were drilled with spring poles, in which a springy wooden pole was stuck in the ground at an angle and a heavy metal drill bit attached by a cable to the head of the pole. Operators would bounce up and down on stirrups attached to the pole, causing the bit to chop a hole into the hard ground. The hole was cleaned by lowering a specially designed bucket, called a bailer, into it. It was similarly bounced up and down until it was filled with dirt and cuttings to be hauled to the surface. poorly constructed wooden or wicker supports of the shaft walls. One of the reasons for the slow development of the oil industry in Galicia was that an effective drill suited to the terrain had not been developed. Effective drilling rigs used in the United States helped to acount for the rapid development of the oil industry there. In western Galicia, where wealthy estate owners with technical training had entered the industry, attempts were made to develop effective drilling mechanisms. Steam was first used in 1867 to drill a well at Klęczany in Western Galicia, enabling operators to drill to about 200 metres. Mechanization increased oil fever in that area. In 1873, there were about 900 enterprises and about 12,000 workers. It was, however, the so-called Canadian rig that effected the greatest progress in the Galician oil industry. A Canadian entrepreneur W.H. MacGarvey helped develop the rig in the 1860's or '70's which made Canadian drilling technology and Ontario drillers famous around the world. MacGarvey came to Galicia in 1883 and a year later was able to bore holes of 700-1,000 metres. The geology of the Boryslaw area presented a greater problem. It was not until 1892 that his rig was first used there. By 1904 there were thirty boreholes of over 1,000 metres in Borysław. MacGarvey's company, MacGarvey and Bergheim, made him a fortune from his Galician properties. The benzene extraction plant Polmin (Państwowe Zakłady Naftowe), referred to locally as the Benzinierung, was completed in 1911 . The great success and expansion of the industry inspired the establishment of training schools and university courses for oil workers and engineers throughout Galicia. 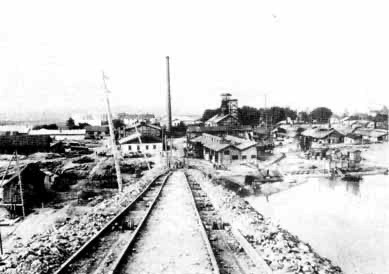 In 1896 a mining school in Borysław was opened. By 1909 production reached its peak, over 2 million tons or 4% of world wide production. The oil fields of Borysław and nearby Tustanowice accounted for over 90% of the national oil output of Austria. At the turn of the century, Galicia was third in the rank of oil producers of the world. In 1918, when Poland became an independent country, oil production was only 822,940 tons or only 40% of the peak of production in 1909. The .main task of the Polish government in the 1920’s was to conduct a serious and systematic geological survey of the Carpathian region and establish new wells. In 1939 the German army briefly occupied the area around Drohobycz and the Borysław oil fields but they left in late September, 1939 when the Ribbentrop-Molotov non-aggression pact was signed in August, 1939. The Russians then confiscated the oilfields from their owners. Alex Sharon relates that in Israel in the 70’s, he met an old Jewish chap, originally from Riga, Latvia who told him that as a young engineer, he arrived in Borysław in early October, 1939 with the Soviet military and occupation authorities to take possession of the newly acquired "energy resources," such as the oil fields. Some of the local technical specialists were sent to the Soviet Union with the Polish and Jewish “bourgeoisie,“ the rich landowners, businessmen, intelligentsia, and other potential “enemies of the state,” to work in the Gulag or other industries. The oil industry was fully operational during the Soviet occupation of 1939-1941. Because Poland had introduced updated refining technology during the inter-war period that was unknown in the Soviet Union, many Russian specialists from the Baku and Grozny oilfields came to Borysław to learn latest technology. When Germans occupied Borysław in June, 1941, many of the workers in the oil industry managed to escape to USSR. In his book, Leopold Held writes about his life in Kazakhstan during the second World War where numerous specialists in drilling and refining survived during the war. The Germans maintained drilling and refining operations throughout the war and many Jews were able to survive the brutal German occupation for some time as "workers needed for the defense industry of the Third Reich." Closer to the end of the war, even these workers began to be targeted. Dr. Berthold Beitz, a young German engineer and director of the oil industry, managed to save the lives of many Jew, but most were deported to the harsh labour camps, Płaszów and Janowska, or to extermination camps. Dr. Beitz, who became chairman of the Krupp Industry after the Second World War, was honored with the title of “Righteous Among Nations” by the state of Israel. 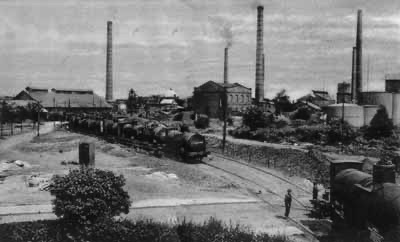 Following the war, there continued to be activity in the petroleum industry in the Borysław area. 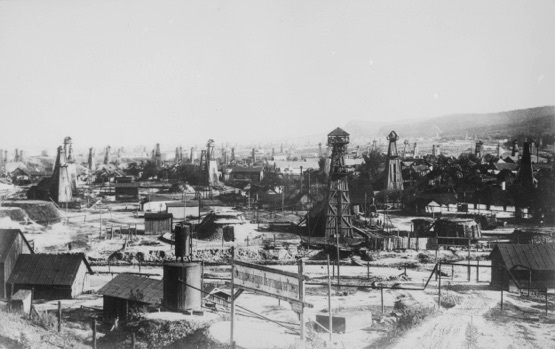 Although little oil was pumped from the fields, the industry continued to dominate life in this area. Alex Sharon writes that as a young child, he and the other children would practise skiing on the wysypy (man-made hills of tailings from the ozokerite mines) until they could ski in the mountains. His friends’ parents worked in the ozokerite mines or drilling for oil in the Mrażnica, Schodnica, or Tustanowice oil fields. Local trade schools produced the artisans for the oil and gas industry and the local technical college produced technologists for the oil fields and mechanic shops serving the oil and gas industry. Many local Russian and Ukrainian high school graduates went to the Lwów (Lviv) Polytechnic Institute or the Moscow Specialized Petroleum Technical Institute (called the Kerosinka) to return to the town as petroleum engineers. His male cousins, elder brother, and he himself also followed this profession. 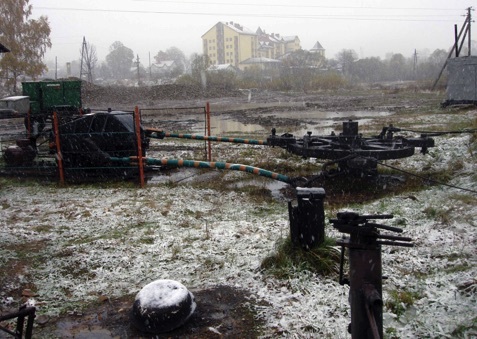 A nineteenth century pump still operational in Skhidnytsia (Schdnica) , Ukraine. For more information about the owners of the petroleum companies, see The OIl Companies of the Drohobyc Administrative District. This history was created by Valerie Schatzker. 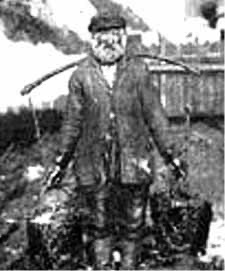 “They dug pits forty to seventy metres deep without safety devices and brought out the wax by lowering men in large buckets into the pits to dig and bring up whatever they found. Everything was done in a primitive manner, without machinery or tools. The excavated rocks were then dispersed on the ground and poor people would extract wax from them. These workers, who extracted wax from the stones] were called łepaks." During his childhood Alex remembers the Tyśmienica River and other small streams as always full of the mazut, the crude oil leaking from the pipelines in the oilfields and the piping systems of the refineries. The rivers were virtually black, without traces of fish or any life below the water or on the surface. Adam Bratkowski, a tinsmith, fashioned the first lamp to burn naphtha, and in July 1853, the hospital in Lemberg, the capital of Galicia, became the first public building to be lit with naphtha lamps. By 1858, the north train station of Vienna was lit with oil from Drohobycz. Jewish labourers were unemployed. The plight of their families was a catastrophe in the community at the turn of the century. The Austrian banks, who had invested in the ozokerite industry, soon discovered that the wax deposits had been depleted. 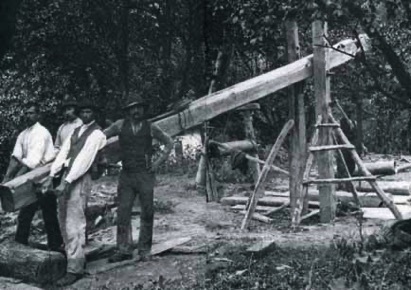 By this time, new developments in the exploitation of crude oil had been developed and oil derricks were beginning to be constructed in the areas of Galicia where petroleum was found. 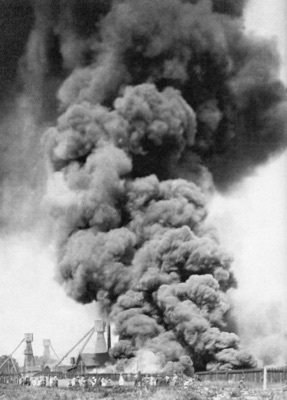 The flammability of crude oil was well known, but when it burned it sputtered and had an unpleasant odour. From ancient times, people tried to refine it so that it would burn with a clean flame, but were unsuccessful. Along the southern border of Galicia, in some areas of the Carpathian Mountains where hydrocarbons were abundant, collecting oil and digging for ozokerite were a cottage industries. especially for skin diesases in animals. In the Boryslaw area, another hydrocarbon, a natural mineral wax called ozokerite, was often found near crude oil deposits. It was used for making candles. sizeable order to light the city's streets. However, Hecker was unable to fulfull his contract, either because his source of thin crude oil that he distilled for his fuel dried up or because the poor state of the roads in Galicia made reliable delivery impossible. His business failed. surface. Some spectaclar conflagrations lasted for months, caused great damage to the environment, and threated the lives of the miners and surrounding communities.